Il presente testo costituisce oggetto del diritto d’autore, quale opera dell’ingegno di carattere creativo, appartenenti al mondo della letteratura, della musica, del teatro e della cinematografia, delle arti figurative, dell’architettura, della scienza. La copia e l’utilizzo del presente testo è severamente vietata, punita per legge. In caso di trasgressione Il Museo archives Giovanni Boldini Macchiaioli, tutelerà i propri diritti per vie legali, intraprendendo azioni di responsabilità e richieste di risarcimento danni. Art. 2575-2576-2577 c.c. e normative internazionali. Legge n. 633/41, conforme alla tutela prevista dalla Convenzione di Berna. Legge 22 aprile 1941, n. 633 e successive modificazioni, e dall’artt. 2575 e seg. del Codice Civile (Libro Quinto – Titolo IX: “Dei diritti sulle opere dell’ingegno e sulle invenzioni industriali”). Giovanni Boldini was born in Ferrara, in via Volta Paletto 1941, on 31st of December 1842 from the marriage (1830) between Benvenuta Caleffi (1811-1875) and Antonio Boldini (1799-1872), a painter under the guidance of Giuseppe Saroli and only son of Beatrice Mandolini and Giuseppe (1774 – 1808). He was baptized the same day in the church of Santa Maria in Vado with the names of Giovanni Giusto Filippo Maria. His godfather was Filippo Pasini. His siblings were: Beatrice (1830), Luigi (1832), Carlotta (1833), Filomena (1835), Maria (1837), Giuseppe (1839), Gioacchino (1841), Francesco (1844), Gaetano (1846), Anna (1848), Veronica (1850) and Pietro (1852). Between 1844 and 1846, Antonio Boldini created the illustrations for the “Vite de’ pittori e scultori ferraresi” (“The lives of Ferrara painters and sculptors”) by Girolamo Baruffaldi. During that same period, the following people died: Giovanni’s great uncle, Luigi (1772-1846), a rich lawyer who, not having any direct descendants of his own, left part of his personal possessions to his descendants, naming Antonio and his brother Carlo (1782 -1849) as beneficiaries. The following year, the Boldini family transferred to the late uncle’s house in Borgonuovo 1719. In 1850, Boldini received his confirmation and began to attend elementary school in the San Domenico district, where Antonio Bottomedi taught. Boldini abandoned his studies prematurely to dedicate his time completely to drawing. Together with his other siblings, he suffered from tuberculosis. His sister Beatrice got married (1852), who with her husband resided for a certain period in Via Volta Paletto 353, as guests of her grandmother Beatrice and her second husband, Luigi Federzoni. At the age of fourteen (1856), Boldini painted a masterly self-portrait. He practiced with spinet. Those were the years in which he attended the Gerolamo & Gaetano Domenichini Art School. 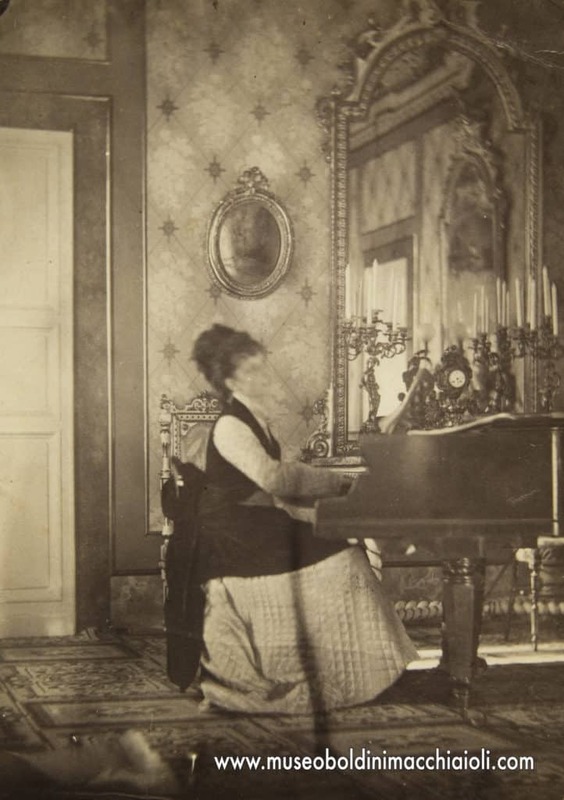 Following her husband’ death, Beatrice Mandolini – his aunt – as Zanin (Giovanni) called her, moved to her son’s house in 1857, where she spent the last three years of her life. In 1859, he created a copy of Raffaello’s Madonna della seggiola which was commissioned by Alessandro Gori. Between 1859 and 1862, thanks to his friend, Timoteo Pasini, Adele Passega’s fiancé, he met Adele’s sister, Giulia, with whom he fell madly in love. However, this sentiment was not shared and, in fact, the girl got married a year later to Cesare Gualandi of Bologna. In 1861, Giovanni was exonerated from military service because he was only 154 cm. tall, a centimetre below the minimum height required. Thanks to a mortgage placed on the house in Via Borgonuovo, Giovanni received 3,724 Lire in 1862. When his brothers Gioacchino, Giuseppe and Luigi reached the age of adulthood, in 1863, he received 29,260 Lire as his part of the inheritance left to him years before by his paternal great uncle, a sum which in a few months (1864?) allowed him to transfer to Florence, accompanied by his friend Enea Vendeghini. In the Grand Duchy city, he became friends with Michele Gordigiani (probably already in contact with his father), Cristiano Banti and Telemaco Signorini, with whom he would meet at the Caffè Michelangiolo and at the Caffè Doney in via Tornabuoni. He lived in Florence, at least for a certain period, in via Lambertesca 10, on the third floor. Coinciding with Easter 1864, Boldini returned to Ferrara for the funeral of his brother, Francesco. He met the Laskarakis and Marcellin Desboutin, who offered him hospitality in the Ombrellino villa at Bellosguardo. Between 1865 and 1866, Boldini went several times to Diego Martelli’s estate at Castiglioncello, and presumably also to Ferrara to his sister Anna’s funeral (1856). He exhibited L’Amatore delle arti (The Art Lover) at the Società d’Incoraggiamento in Florence. He was awarded a prize by the Ministry of Agriculture and he later received his first enthusiastic review signed by Telemaco Signorini. In the same year (1866), he may have travelled to both Lombardy and Naples with his friend, Cristiano Banti. He may have visited the Reggia di Caserta – a probable setting for his Cavaliere painting. On his return to Florence, he met the noble English family by the name of Falconer, who invited him to Falconiera, a small villa in Collegigliato, near Pistoia. During these visits which continued until at least the end of 1868, Boldini met the Drummond-Wolff and Cornwallis-West families. 1867 was the year of the well-known dispute with Desboutin, who asked Signorini’s intervention in order to reobtain the keys of his studio, which were still in Boldini’s possession. The latter wrote to Martelli in May stating that he had recommended his house at Castiglioncello to the Amigues family for the coming summer holidays. In the company of a Greek friend, introduced to him by Mrs Falconer, he went to Paris in June to visit the International Exposition, passing through Milan, Arona, Garda, Switzerland, Sion and Neuchãtel; He returned to the Martelli estate in Castiglioncello in July. In the Autumn, Boldini travelled to Monte Carlo with the Falconers, guests of General Marchese Esteban José Andrés of Serravalle, whose portrait he painted. Having returned from the French Riviera in 1868, he was a constant guest of the Falconers at Collegigliato, where he painted frescoes in their dining room. During the year, he kept in contact with Signorini, who visited him, from time to time, in Pistoia. Mrs Falconer became ill, and due to Boldini’s scarce working engagements, their friendship began to fall apart, causing a legal dispute in which the painter claimed failed payment for some works still to be completed and which the noble lady declared she had never requested. Mrs Falconer had asked Signorini several times to intervene and to help clarify the situation. Boldini later painted another portrait for the Falconer family, who undertook to pay one thousand francs. Isabella Falconer died a year later following a long illness. According to what Isabella’s daughter, Adelina Wolff, wrote, the painter was still in debt with the family and she urged him to complete the portrait of her son which he had begun to paint months before; Boldini arranged an appointment for the sitting, but he never went there. The house in via Borgonuovo in Ferrara, which had been inherited by the Boldini family in 1846, was sold in September. The family moved to via Volta Paletto in April. As can be witnessed by the paintings Dalla soffitta a Ferrara (From the attic in Ferrara) and Giovane alla finestra (Youth at the window), in whose backgrounds the Estense Castle of Ferrara, as seen from via Borgonuovo, is recognizable. In 1870, Giovanni spent a certain period in his birthplace, perhaps during the month of March, when his nephew, Francesco – Gioacchino’s son, died. On 16th of May 1870, the artist requested a certain Mrs Williams to pay him for the packing and transportation of some paintings. The receipt addressed to him, on the other hand, is dated 31st of May, to the amount of one hundred and thirty Lire in favour of a tailor for the realization of certain clothing. The Florentine bankers Mattini & Eyre, who having demonstrated in good time their willingness to pay the amount owed to Boldini, appeared annoyed by Boldini’s request of payment from Mrs Williams. Boldini’s newly born nephew, Umberto – Luigi’s son, died on 10th of October. Giovanni exhibited his paintings for the first time in a non-identified private art gallery in London. In March 1871, he received a request for payment from the sculptor, Egisto Galiani. On 3rd of May 1871, his nephew, Antonio – Beatrice’s son, died in Florence; Immediately afterwards, on the 19th of May, Boldini moved to 14 Brunswick Square, in London, guest of the art merchant, Frèdèric Reitlinger, whom he had met in either Rome or Florence. He frequently visited Vito D’Ancona and constantly produced portraits for the English nobility. In June, he met Sir Cornwallis-West again, who persuaded him to transfer to his studio at 49 Eaton Place, moving periodically to West’s castle in the countryside. Cornwallis-West helped him to procure excellent commissions by introducing him to the Duke of Sutherland, the Duchess of Westminster and the Princess of Pless; Boldini became known as the “Little Italian” in London. Giovanni announced a trip to Paris. At the end of August, he resided in a castle at Welsh, where he was called upon to paint a portrait of the elderly owner. During the first days of November, he established himself permanently in Paris, where he lived with the model, Berthe, at 12 Avenue Frochot. He had contact with the merchant, Adolphe Goupil, whom he had probably met in London. Their working relationship, at least until the end of 1878, reinforced his artistic capacity. He moved to 14 Place Pigalle with Berthe, in the early months of 1872. In spring, he recommended his friend Banti to Albert Goupil, son of the affirmed merchant Adolphe, who had arrived in Italy with the intention of purchasing paintings. In July, he returned to Ferrara on the occasion of his father’s death. He then went to Venice and worked on San Giorgio island. He planned a trip to Spain, where he had wanted to stay from January to May. We do not know whether this transfer took place as foreseen – however, it is confirmed by at least one painting of a Maghrebian subject and two of a Hispanic subject, one of which was dated 1873 : Dopo il bagno (After the bath), Coppia in abito spagnolo con due pappagalli (Couple dressed in Spanish clothing with two parrots), Torero e Suonatrice di chitarra, 1873. (Torero and female guitar player). Having returned to Paris in June 1873, Giovanni left for a stay at Combs-la Ville, where Signorini joined him. They remained in contact thereafter. On 30th of November, he subscribed to “Giornale Artistico” from Paris, in which both Adriano Cecioni and Telemaco Signorini collaborated. He advised the latter to send his paintings to Goupil and also asked him to inform Cecioni as to how much he enjoyed his article on Ernest Meissonier. He wrote again to Signorini on 26th of December, informing him of how badly the sales were proceeding and above all that he had not managed to part with the works he had left in Paris. He decided, however, to entrust them to Goupil in order to propose them again at a better moment. During the summer of 1874, he painted in the park of Versailles. Between October and November of the same year, he first went to Ferrara to visit his mother, who was gravely ill and then to Florence. During this same period, his housekeeper died in Paris. Mariano Fortuny, whose artistic influence he had absorbed, died in November. His mother died on 7th of March 1875. Giovanni invited Michele Gordigiani to stay at his studio and he also met Antonio Mancini. He started a relationship with Countess Gabrielle de Rasty and rented a love nest with her at 24 Avenue Trudaine. In May, he transferred to a furnished villa at 33 Boulevard St. Antoine, Versailles, where he painted for Goupil, this inspired him to create outdoor scenes, which were set in the beautiful royal gardens of that locality, many of which were commissioned, above all by Americans who had identified “la sapiente resa del vero natural” (“the wise yield of the true natural”). The work with the title Parc de Versailles was sold in New York in 1888 at a Steward auction for 17,000 francs, which Emmanuel Benezit punctually noted. He asked Banti to send him some oil from Tuscany. On 26th of September, having been struck by an incurable disease, his first fiancée, Giulia Passega, died at the Psychiatric Hospital in Ferrara. She was only thirty-three years of age. Giovanni opposed exhibiting his works of the Florentine period at the Lega Borrani Gallery as he considered them juvenile and therefore did not represent his present style. He asked Banti to send Cecconi’s portrait back to Paris which had been requested for this purpose, as well as the pencil drawing of his parents. In 1876, he was Cristiano Banti’s guest, first at Montemurlo and then at Montorsoli. According to his correspondence with Telemaco Signorini, the artist announced in 1877 a three-month journey which took him from Bougival to Normandy and then to Spain. His nephew, Arrigo – Gioacchino’s son, died in February. Boldini invited the sculptor, Vincenzo Gemito, who sculpted his bust. Mancini visited his studio. His sister, Beatrice, died on 6th of December. Signorini sent Giovanni a copy of The 99 Artistic Discussions. In 1878, relations with the merchant Goupil slowed down; Boldini became friends with Degas. On 16th of June, he joined Diego Martelli in Paris, together with Leto, Signorini and Pisani. During the summer, Boldini visited Étretat and Montroyal. Martelli, correspondent of “The Gazzetta d’Italia” in Paris, reviewed some of Boldini’s paintings, which appeared at an auction in which a collection of the baritone, Jean-Baptiste Faure was sold. Only in 1879 did he participate, for the first time, in the Salon Ufficiale, where he exhibited La dépêche. At first, he preferred to work on his own and to develop relations with various merchants – Americans, English, Germans as well as with the French merchant Goupil – complying with their commissions or with personal proposals. “Little known in Italy, having never sent anything to the Salon, Boldini was already well-known among the amateurs in France, England and America”, wrote Folchetto in 1889. 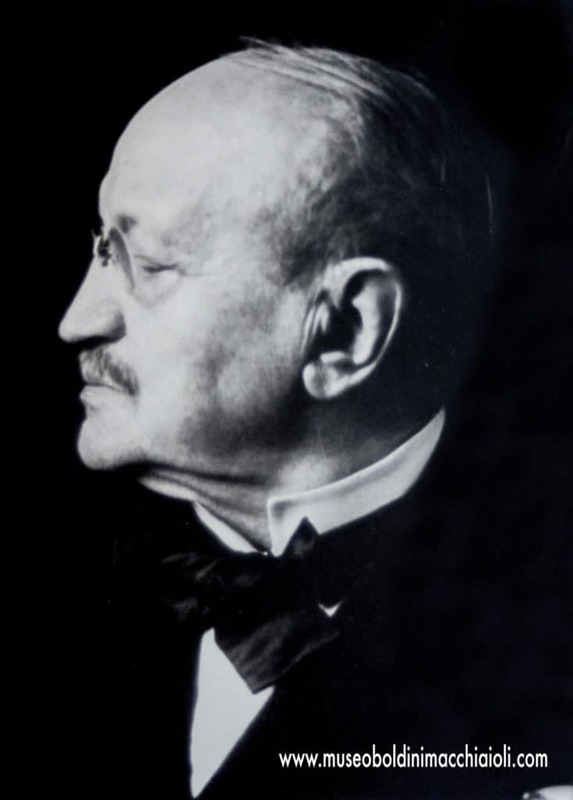 His precocious affirmation in America and Germany was also remembered by his brother Gaetano in the latter part of his life: “Unfortunately I do not have any photographs of that period, many of these paintings are in America and also in Germany and were much appreciated by Menzel, “the best and most illustrious artist in Germany.” He then joined the Cercle de l’Union Artistique (Committee of the National French Society of Artists) in order to seek further contacts with a public institution: Meissonier was president of the painting section and Raimundo de Madrazo was an associate; He visited Venice and painted inside Palazzo Rezzonico. He stayed in Étretat for a while. During the first few days of July, he corresponded with the collectionist, Victor Desfossés, who invited him to join him at the Royat baths. On 28th of July, Enea Cirelli, Beatrice Boldini’s widower, married her other sister, Filomena Boldini. His brother, Gaetano, married Amalia Bocchi. Boldini exhibited his works at the Arthur Tooth Gallery in London. He became acquainted with the director of the Prado Museum, Federico de Madrazo, Mariano Fortuny’s father-in-law. As from the beginning of this year, he was in constant correspondence with the young Raimundo de Madrazo and most likely, participated at the Cercle de l’Union Artistique exhibition in February 1880, perhaps presenting a portrait of Alice Regnault on a horse, which is to be found in Milan today. The painting was exhibited in May at the official Salon with the title of Portrait of M.me*** no. 384 in the catalogue and described by Philippe Burty in Le Salon in 1880, in ”L’Art” June 1880, p. 304. Jacopo Caponi, alias Folchetto, correspondent from Paris, also remembered him in the June issue of “Fanfulla”: Paris notes, 14th of June 1880. The Salon taken in homeopathic doses. “Boldini exhibited a small precious painting which represented a lady rider on a horse. Seated turning her face towards those watching and showing the pleasant curves of her body on a saddle. It is a jewel of execution which is immensely appreciated. It attracts even more public curiosity because it is known that the model is, in fact, the beautiful Alice Regnault, and the painting has been the cause of a scandalous incident. They say that Boldini created this equestrian portrait, to then donate it to the celebrated actress – celebrated for her beauty – and then demanded 15,000 francs. The truth is that he had never made any agreement with her, and to thank her, he gave her one of his works of great value. Neither is it true that the painting was sold. I am sorry for miss Regnault, but to be precise, I have to say that an American gentleman has offered 15,000 francs…. on the condition that the head is changed!! Boldini refused ‘because he wants to keep it in memory of the displeasure which caused him’ ”. Boldini wrote to Signorini in June, asking him to accompany him to Brittany. He travelled to Holland in August, where he had the opportunity to admire Frans Hals’ prodigious portraits. On 14th of September, he exhorted Serafino De Tivoli to return to Paris from Italy because the painters at the Nouvelle Athênes Café – Degas, Desboutin and Fichel – so wished. He exhibited the Portrait de Mme la Comtesse de R., at the Salon in 1881, thus opening that endless vein of splendid female figures: “what great talent in rendering your eyes so brilliant, your skin so velvet-like, your smile so young and your pose so natural!“ swrote Maurice Du Seigneur in the exhibition review. In May, Mancini sent him an incomprehensible letter from Naples Provincial Mental Hospital. Giovanni met Signorini who had arrived in Paris to visit the Exposition. In July, he went to Chatou with Berthe, where he welcomed Signorini and De Tivoli. In 1882, Master Emanuele Muzio, on completion of his portrait, did his utmost to persuade Giuseppe Verdi to pose for Boldini. Verdi was enthusiastic about the small paper portrait which Boldini had sent to Muzio: “You can see that it has been done by a great artist”. As from this year, Boldini had a professional relationship with the German art merchant, Lepke, to whom he sent his paintings in order to receive his comments. 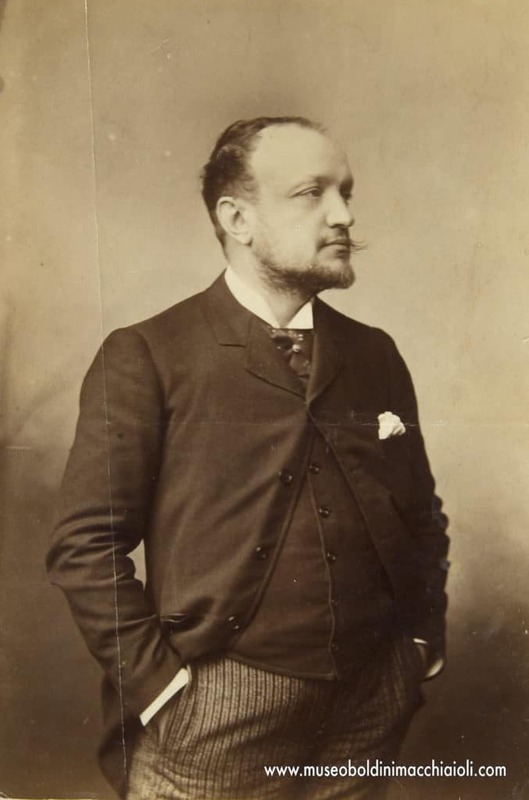 Lepke was Adolph Menzel’s art gallery manager, who had expressed his desire to see Boldini’s works. This happened prior to his contact with Menzel before he went to Berlin in 1886. Menzel already possessed one of Boldini’s works, which he had bought through Goupil in 1872 : “Intérieur d’atelier” (“The interior of the studio”) as was recorded in the Maison’s sales files. During the 1880s, contacts continued with the London gallery manager, Everard, with the English sales firm Arnold & Tripp and with the American merchants Charles Warren Cram, Samuel Putnam Avery and George Lucas. In December, Boldini presented six paintings at the Première Exposition de la Société Internationale des Peintres et Sculpteurs” at the Georges Petit Gallery: Deux etudes (pastels, no. 13), Portrait de Mme Fortuny (no.14), Station d’omnibus (maybe Omnibus in Place Pigalle, no. 16), Le panier de fraises (the basket of strawberries – maybe firstlings, no. 17) and a portrait of M. A. (no. 15). The presence of the latter, i.e. the portrait of the painter Joaquín Araŭjo Ruano, reproduced in the catalogue as an engraving and dated 1882, allows one to anticipate its realization, which until now was placed around 1889 – 1890. The work was probably also exhibited in Munich in 1890 and in Berlin in 1896. It was definitely exhibited at the Universal Exposition in Paris in 1889. Giovanni became an honorary member of the Accademia delle Arti del Disegno in Florence on 17th of December. In 1883, he was conferred the honour of Cavalier of the Order of the Italian Crown. In January, he donated her portrait which he had painted a year earlier to Cecilia de Madrazo Fortuny, which she considered to be “very, very beautiful”. He frequented La Rochefoucauld Café, where he met Degas, Pisarro, Cervax, Spiridon, Liardo, Fichel, Pittara, Manzi and, several times, also Signorini. Enea Cirelli died on 13th of June. Writing to his brother Theo, Van Gogh manifested his prejudice regarding Boldini’s paintings, and then changed his mind immediately in a subsequent letter. In November, Giovanni attended a representation of Verdi’s Simon Boccanegra, together with Muzio, and remained fascinated. According to a written testimony by Signorini in 1884, Boldini was on bad terms with Degas. Signorini, who was in Paris from 20th to 25th of June, visited Boldini at his studio, where he met the model, Luisette and, later, Deleu (i.e. Paul-César Helleu), a friend of Verdi’s. Before Signorini left, the two friends exchanged two paintings: Boldini’s was Signora in costume impero seduta al tavolo (Lady in imperial costume seated at a table), which he had created years before. Giovanni began to frequent Helleu. Giovanni wrote some letters recommending Signorini, first presenting him to Durand-Ruel and then to Léon Boussod, who had replaced Goupil at the direction of the Maison (firm). He sold some works to the American art merchant, Charles Warren Cram, with whom he remained in contact until 1891. The artist also produced a portrait of the merchant’s wife, Ella Brooks Carter. In December, he went to Nice to attend a representation of Aida. At Christmas 1884, he was Verdi’s guest in Genoa, together with Muzio; he then went to Florence, where he arrived on 27th of December and was affectionately welcomed by many friends. demanded his portrait created by his friend, informing him that he had added colour behind the portrait that Boldini had created of Alaide and had also painted the frame in gold. He attended Victor Hugo’s funeral in May. He corresponded with Leopolda Banti Redi also regarding a pair of boots for Alaide, which were to be made by a French shoemaker and then sent to Florence. Boldini, at the beginning of July, left for Naples and stayed at the Hotel Royal Chiatamone and met Morelli, Gemito, Altamura, Dalbono and many others. At the end of the month, he went back to Tuscany again, as Banti’s guest at Montorsoli, with whom he made a trip to San Gimignano. In September, he returned to Paris, where his friends found that he had put on weight. He wrote to Muzio, asking him to send his regards to Verdi. He frequented Degas and De Tivoli. He suffered from a toothache. On 26th of December, he wrote to Alaide’s mother, Leopolda, asking her to allow her daughter to spend a period of time with him in Paris; annoyed by her negative reply, he declared his love for Alaide. In March 1886, thanks to Muzio, he met Verdi on his way to Paris with Giuseppina Strepponi; in a brief period, he first painted an oil portrait of the Master and then a pastel portrait, the only work exhibited in the same year at the Georges Petit Gallery, but not on sale. In November, Giuseppina thanked Boldini for the photograph which she had received through Muzio, perhaps referring to one of her husband’s portraits. After which, she thanked him personally in Milan. Boldini presented his works at an exhibition in London which was held at the Obach & Co, Gallery in May. He frequented Alfred Stevens and Serafino De Tivoli. Cecioni died in May. On 1st of July, Boldini moved to a small villa, at 41 Boulevard Berthier, in the area of Plaine Monceau, which had been rented through his friend, John Singer Sargent. He corresponded with his friend Banti, who did not believe in Boldini’s imminent journey to Italy where, on the contrary, he exhorted his friend to go in order to find fresh stimulation. Boldini, on the other hand, announced his next journey would be to Dijon, Geneva and Vevey. In September, he went to Germany, stopping over at the Veil-Picards in Besançon to continue his journey with them to Geneva, Aix-les-Bains, then alone, to Menzel in Berlin. During the journey, he met Banti’s son, Leonetto. In this period, he corresponded intensively with Muzio, who was also in constant contact with Verdi. The idea came to Boldini to create an engraving of the pastel portrait and then to publish it, at Ricordi House’s expense, in the luxury edition of Othello. However, even though he was enthusiastic about the idea, he did not create the engraving personally, but he was involved in its creation. Boldini asked Banti, as a pretext, to procure his son Alfred’s English address, with whom Alaide was staying, but did not receive any reply because Leopolda had forgotten to write to him. He went to London in the Autumn, where his artistic work was a great success, as his friend, Banti, later confirmed. At the end of the year, he was frequently in contact with Faure, who intended to exchange the painting he had bought in 1875 entitled Pièce des Suisses (Versailles) with a landscape and a small portrait of a woman. His friend, Agnès Carpenter wrote to him from Dresden, where she was on holiday with her sister. The correspondence between them also continued from Rome in March 1887. On the occasion of the opening performance of Othello in Milan on 5th of February 1887, he received, from Muzio, a small gift and a letter in which the musician assured him of a seat at la Scala, as well as for his friend Henry Poidatz. Verdi welcomed him at La Scala and gave him a copy of the opera with a dedication. At the reception in honour of the musician, the artist also met Jacopo Caponi, who had already, at the end of the year, reminded Boldini that he had written an article about him in the second number of “Illustrazione Italiana” dated 9th of January 1887. On that occasion, he had also published a portrait of the artist and an original drawing by Boldini referring to his painting Cavalli di rinforzo (Chevaux de relai). Caponi, in his article, had stated that the painting would have been exhibited at the “Esposizione Nazionale Artisitica” in Venice in the following month of May, in which Boldini had then stated that he would not participate. In February, Giovanni was in Venice on a work trip and was accompanied by Poidatz. In spring, he went to Paris, where his friend, Agnès Carpenter, hoped to meet him for a dinner before leaving the city. Perhaps in August, Boldini went to San Sebastián for an exceptional season of bullfights of which Paul Lafond had informed him about at the beginning of August, when he recommended him to take the journey. In September, he attended the Exposition in Venice in which he had not participated. He was once again in Venice in October, from where he continued his journey to Verona with Banti. In Venice, they found themselves in the company of Enrico Pestellini, of whom, Boldini created a caricature of amazing resemblance. He asked Banti to enquire, on his behalf, about the purchase of an estate in Tuscany. His friend, Timoteo Pasini, wrote to him from Buenos Aires, asking the artist to let him have some paintings with a view to selling them. During the first months of 1888, Boldini continued to correspond with Muzio: Muzio was following the rehearsals of Othello from Naples and Modena. The composer, who was in Milan, exhorted him to prepare two pastels; one for him and the other for a colleague, Angelo Tessaro, who had discovered a product to fix the pastel. Boldini experimented with this technique and also began to use the fixative, informing Banti who requested a bottle. Boldini had previously told him that he had created six large pastel portraits of South American ladies: among which, the last one to be completed was that of Emiliana Concha de Ossa, also known under the title of Pastello bianco (White pastel). A second version of the beautiful eighteen-year-old’s portrait, completed by the artist, accompanied the Concha family to South America. His friend persuaded him to return, and finally Boldini spent some months, from August to November, in Italy. He tried to see Lola Laskaraki, an old flame, but she refused to meet with him, and in a letter, she motivated her refusal by affirming that she did not want to profane her sweet memory of their past love. The itinerary foresaw stopovers in Rimini, Ferrara and Florence; he left for Rome with Banti in October, where he saw Vincenzo Cabianca. He also programmed a trip to Montecatini Terme, to meet Verdi, and then to Siena where he found his sisters, among whom Maria, who was almost dying. In September, he went to Venice, and immediately afterwards he visited Verdi at Sant’Agata. Then on to Bologna, where he attended the National Exposition. Already in May, he had agreed to create the musician Gaetano Braga’s portrait together with his violoncello. On 20th of October, he went to Milan on his way to France and met with Verdi in Borgo San Donnino, spent a pleasant day with him and stayed at his villa from where, the following day, they left together for Cremona direct for Giuseppina Strepponi’s. In November, he returned to Paris with his niece, Eva, his brother Gioacchino’s daughter. In a letter to Banti, he remembered when, in the 1860s, he had been stung by a jellyfish in the waters of Castiglioncello while he was staying with Martelli, and he manifested his intention to acquire an estate near Siena, where he could spend his old-age. As was his custom, he asked Banti to send him a supply of oil but also vinsanto wine. He attended lessons at Madame Lacanne’s riding school in rue Tilsit and also fencing with Francesco Recalchi. In December, Paul Lafond informed him that he had begun engraving Verdi’s portrait, which was completed for Ricordi the following year. At the Universal Exposition in 1889, Boldini appeared both as an exhibitor and also as a committee member of the Italian artistic sector. In this position, with Signorini’s assistance, he had to overcome many difficulties and experienced hostility from many Italian artists, who were dissatisfied with the scarce results which had been attained. He exhibited five oil paintings at the exposition: Chevaux de relai (Horses of reinforcement, which is missing today), Portrait, Portrait, intérieur d’église (Interior of a Church), L’Église Saint-Marc, a Venise (San Marco’s Church, in Venice). He also exhibited various pastels: Portrait, Portrait, Portrait, Portrait de Mme Felix Vivante, Portrait, Portrait, and a water colour Les Amis (The two friends), which was created in 1884 and the ambience of which was the studio in Place Pigalle. Among the pastels, the so-called Pastello bianco (White pastel) received the Grand Prix as well as the gold medal. At the end of July, he wrote to Signorini asking him to communicate the lowest possible price for the Lega painting and of the others which would participate in a lottery in order to sell the unsold works after the closure of the Exposition. Being evidently interested in the fortunes of the other artists’ paintings, Boldini received consent to lower the prices of various artists, among whom Telemaco Signorini, Silvestro Lega, Raffaello Pagliaccetti and Carlo Pittara. Having concluded his commitment at the Universal Exposition, he travelled to Trouville for a short holiday. In the middle of August, he returned to Paris and received Mrs Marguerite Poidatz, who would pose for a portrait together with her daughter, Hellen. In September, he went to Spain and Morocco together with Degas, passing through Madrid, Granada and Tangiers; on visiting the Prado museum, he expressed a great admiration for Velázquez’s work. As from the end of August, he had exchanged a lot of correspondence with Degas in order to plan the journey. The Frenchman informed him of the excellent information he had received from Lafond and from the bullfighting manual which he had sent. On 2nd of October, on his return to Paris, Boldini told Signorini that the commission had met during his absence but did not know whether his friend had been chosen for the lottery prizes or not. On 30th of October, he was conferred with the honour of Cavalier of the Legion of Honour. Two months later, his sister, Filomena, died. On 26th of December, he wrote to Signorini asking him if he had received the sum of three hundred lire for the painting which had been sold at the lottery. He corresponded and maintained relations with Lega. In June, “La Reforma” published an excellent review of the Paris Exposition; Boldini asked Banti to send him a copy of the newspaper. In a letter, he said that he was very busy and was continually attending official lunches. At the end of the month, Lafond informed him that he was taking care water colour engraving The two friends. In February 1890, he adhered to the subscription for the purchase of Manet’s Olympia, with two hundred francs, with the intention of donating it to the Louvre museum. Boldini considered Manet’s art an important source of inspiration also for his artistic activities. He enrolled in the Société Nationale des Beaux-Arts, founded by Meissonier and others, to exhibit annually in opposition to the Société des Artistes Français. He travelled to Trouville in summer, probably together with Helleu. He also took part in an exhibition in Munich, the second “Jahresaustellung” during which, on July 31st, he was awarded the second-class gold medal for the painting “Zwei Freunde” (Two friends, n.160, bought by the Bavarian State and placed in a Picture gallery; the work was later lost). He also presented: Vorspannpferde (Two horses, n.161), Männliches Bildnis (Male Portrait, n.162), Die Familie des Herrn Brown (Mr. Brown’s Family, n. 163), Porträt der Frau Jourdin (Mrs. Jourdin’s Portrait, n. 164), Porträt der Frau Berthier (Mrs.Berthier’s Portrait, n. 165). The painting Piazza delle Erbe in Verona dates back to 1890 and proves his presence in Italy that year. Giovanni took English lessons. R.J., Portrait de Mlle Berthier, Portrait de Mme H., Portrait de Mme Poidatez, Portrait de Mme X and Étude. Raimundo de Madrazo asked Boldini the price of the latter, exhibited at the Salon du Champ-de-Mars, on behalf of a friend who wished to buy it. But the painting had already been sold; it had oddly remained in the painter’s studio for a long time. Emanuele Muzio died in November. Boldini’s friendship with Robert de Montesquiou dates back to the end of that year. Boldini presented him with a portrait of Whistler or it was somehow connected to the American artist who was also about to begin a portrait of Montesquiou. In the early 1890s, Boldini met Pierre-Georges Jeanniot, a Swiss-French painter and engraver, who was Degas’ friend; they both accepted his invitations. Boldini perhaps portrayed his wife Henriette and also proposed the artist’s name to Selvatico in order to participate in the Biennale in Venice. In 1891 Boldini tried unsuccessfully to have Alfredo, Banti’s son, employed at a Bank in Paris. A series of letters written by John Singer Sargent in May of that year, addressing important American customers in order to present his friend Boldini’s work as a portraitist, show that the latter was already planning his future journey to America: in July of the following year, he in fact announced his imminent overseas transfer to Banti. The artist was already quite well known in American artistic circles as a result of the diffusion of his refined “outdoor representations” of the 1870s and also for the significant presence of his works at many American exhibitions. The success achieved by Sargent’s portraits in America perhaps persuaded Boldini to follow the same path and to present his innovative work, as a portraitist, in a country which still honoured it. He soon exhibited three pastel portraits in April at the 7th Exhibition organized by Société des Pastellistes. On the contrary, at the annual Parisian Salon he exhibited: Portrait de Mme D., Portrait de Mme S., i.e. The Argentinian Singer, and Portrait de M. S., i.e. Portrait of young Subercaseaux. In June he went to London. He was in Aix-les-Bains in August in order to have his leg treated at the Spa. In September he was in Bologna, Brescia and Venice. He took part in the third “Jahresausstellung” in Munich where he exhibited: Auf dem Markte (At the market, n. 174a), Der Glockenturm zu Venedig (The bell tower in Venice, n. 1804), Porträt von Verdi Pastell (n. 1805) and two other portraits, among which was Young Subercaseaux’s portrait, which was awarded the first-class gold medal. The gallery manager, Eduard Schulte, asked to exhibit them in Berlin, Düsseldorf and Cologne, thus showing the German market’s interest in Boldini’s works. period, he received some letters from Sir Cornwallis-West, inviting him to his country residence, should he wish to stay in England, where he could portray his two daughters. The relationship between them was therefore continuous and was never interrupted even when Boldini moved to Paris. In 1892 the director of the Uffizi Gallery in Florence, Enrico Ridolfi, commissioned a self-portrait, which Boldini painted while he was Banti’s guest in Villa Montorsoli; in return, he asked and obtained a plaster cast of Cardinal de’ Medici by Bernini. For the first time, Alaide Banti showed indifference to his attentions. He went to Aix-les-Bains again in August. He travelled to Perugia in October together with Banti and Luigi Nono. There he met Nino Costa with whom he went on to Rome. Back in Paris, he gave painting lessons to an American named Ruth Sterling. He had the windows of his study enlarged and planned once more to buy an estate in Tuscany. He exhibited the Portrait of Mme Josefina Alvear de Errázuriz’ together with her daughter’s portrait at the Salon du Champ-de-Mars. He received an invitation again from Heuer and Krimse in Berlin to cede the typographical reproduction rights of Retour de l’Opéra in order to publish it by means of xylography in the major illustrated magazines of that time. Retour de l’Opéra was probably the same painting exhibited at the Continental Art Gallery in Bond Street in June and later also in Dresden in 1897. At the beginning of February 1893, Boldini returned to Milan to attend the premiere of Falstaff and thanks to Verdi he received a bound copy of the opera score from Ricordi, later autographed by the Maestro. Boldini decided to present Verdi with his full-length oil portrait created in 1886. Deeply moved by this kindness, the musician commented that the wonderful portrait “is really the work of an Artist”. Boldini went to Palermo for a short time and then went back to Paris. He contacted Signorini informing him of his movements and that he had sent him some books about the Comédie humaine di Balzac. Telemaco replied enthusiastically and invited his friend to send more of them in order to complete the series of that precious collection. In springtime, Boldini took part in the World Columbian Fair in Chicago, by exhibiting three female portraits: Portrait of a Girl, Portrait of a Lady and Portrait of Miss. In October, he travelled to Bologna, Venice, Trieste and Vienna. The prince regent of Bavaria conferred him with the Order of St. Michael. Enrico Ridolfi introduced the German collector Émile Pacully to him, who lived in Paris. Borrani introduced Colonel Leicoh to him by correspondence, writing that he would like to meet him while he was in Paris. The Mayor of Venice, Riccardo Selvatico, creator and promoter of the Exhibition “Biennale d’Arte della città di Venezia”, asked the painter to join in the sponsorship committee of the 1st edition, with the task of achieving the participation of major French artists of that time. Selvatico was extremely grateful for this support, which was greatly appreciated in Venice. Even the Secretary General of the Executive Committee, Pio Lazzarini, thanked him for his collaboration at the event. This task kept him busy for a large part of that year, causing some preoccupation concerning the preparation of the Exhibition regulations and for the unavoidable tension among the participants. Boldini dissuaded the Mayor of Venice from including Federico Zandomeneghi in the list of the proposed exhibiting artists. On the contrary, he warmly supported the invitation and participation of Helleu, Besnard, Bonnat, Raffaëlli, Gervex, Sargent, Béraud, Detaille, Monet, Tissot, Puvis de Chavannes, Cazin, Duran, Stevens, Rodin, Barrias, Breton, Flameng, Vollon, Gèrôme, Lemaire, Jeanniot, Whistler, Duez, Bartholomé, Dagnan, Bouveret, Roll and Carrière. He began an intense correspondence with Verdi. He debated with Selvatico the necessity of allowing the artists to exhibit works which had already been shown previously elsewhere, since it would have been impossible to produce new works capable of meeting the expectations in such a short time. Boldini also took part, as an exhibitor, in the 1st Biennale of Venice and presented Il Ritratto a pastello di Verdi (Verdi’s pastel Portrait) and il Ritratto della signorina Errázuriz (Miss Errázuriz’ Portrait). The international “Comune di Venezia Prize” was awarded to Francesco Paolo Michetti, who presented La figlia di Jorio (Jorio’s Daughter) whereas Boldini was awarded the National Prize of the “Comuni e della Provincia di Venezia”. At first he refused this prize because he considered it even offensive, since it did not comply with his real merits. Il Ritratto di Verdi (Verdi’s Portrait) was reproduced in the September issue of “Natura e Arte” in an article dedicated to the works which had been exhibited in Venice. William Merritt Chase introduced his student, Mrs. George H. Page, to Boldini. Chase collected various works of the painter: Girl reading, Portrait of a Lady, Ritratto a figura intera (Full-length Portrait), a drypoint copy of Ritratto di Whistler dormiente (Whistler’s Portrait while asleep). As early as June, Boldini resumed the posing sessions with Marguerite Rochefort. He went to London to attend the inauguration of Helleu’s Exhibition, then to Versailles and in September to Venice. During his visit to the “Grosse Berliner Kunstausstellung” (Great Art Exhibition in Berlin), from May 1st to 29th of September, he proposed: Bildniss der Fürstin Poniatowka [sic] (Princess Poniatowski’s Portrait), Im Atelier. Studie (Ruth Sterling in his studio) and Familienbildniss [sic] (Portrait of a Family, probably Mister Brown’s family), and painted Adolph Menzel‘s admirable effigy on 21st of October. He would also have liked to exhibit the Ritratto di Lady Colin Campbell (Lady Colin Campbell’s Portrait), painted during the previous year but her illness prevented him from sending the painting to Berlin; it is preserved at the National Portrait Gallery in London, as Lady Campbell herself donated it to the Gallery as early as 1912. At the Salon du Champ-de-Mars in April 1896 Boldini exhibited: Portrait de la P.cesse P. (Princess Poniatowski’s Portrait, n. 155), Portrait de M. X. (possibly Henriette Jeanniot’s Portrait, n. 156), Portrait de Mme M. (probably Madame Charles Max’ Portrait, not Marguerite de Rochefort’s Portrait, n. 157, as it was thought). The artist wrote to Guillaume Dubufe, treasurer and secretary of the Société Nationale, informing him that he was unable to present the Ritratto di Menzel (Menzel’s Portrait) in Paris as it had been requested by the German Emperor in Berlin. Three female figures appear in the sketch Boldini sent to Dubufe, containing directions on how to arrange three paintings at the Salon du Champ-de-Mars: Ritratto della principessa Poniatowski (Princess Poniatowski’s Portrait) easily recognizable because of its entire silhouette on a large format canvas, likely Ritratto di Madame Charles Max (Madame Charles Max’ Portrait), and a half-length figure, maybe the unknown Dipinto di Henriette Jeanniot (Henriette Jeanniot’s Portrait). The identification of the Ritratto di Madame Charles Max (Madame Charles Max’ Portrait) was confirmed in the article Le Salon (1896) by François Thiébault-Sisson, who detected the artist’s typical ability in reproducing his models’ graceful attitudes. On the other hand, Jeanne Max herself frequently mentioned some appointments for posing sessions at the artist’s studio. In order to identify the unknown Ritratto di Henriette Jeanniot (Henriette Jeanniot’s Portrait), probably Pierre-Georges Jeanniot’s wife, some written records are fundamental, among which a letter dated the 21st of April, in which Boldini explicitly mentioned “Jeanniot’s head” to Guillaume Dubufe, giving directions so that the painting was not located above other works at the Salon du Champ-de-Mars. Another relevant source is Pierre-Georges Jeanniot’s letter, in which he informed Boldini that he had received the painting, perhaps that of his wife’s portrait. The artist refused the mayor of Venice – Count Filippo Grimani’s invitation to participate in the Sponsoring Committee at the second Art Biennale, but accepted, however, to be appointed member of the Jury. The International Exhibition was opened in Berlin on the 1st of May of that year. The exhibition halls 51 to 54 were reserved for the Italian artists. Boldini presented: Bildniss Sr Excellenz [sic] Adolph Menzel (His Excellency Adolph Menzel, n. 274), Park von Versailles (n. 275) (Versailles Park), Herbst (Autumn, n. 276), i.e. two views of the Versailles Park, Kirche in Venedig (Church in Venice, n. 277), Marine. Venedig (Marina di Venezia, n. 278), Venezianische Frau (Venetian woman, n. 279), Männliche Studie (Male Study, n. 280), Studie (Study, n. 281). The paintings exhibited in Berlin received important reviews by the critics: the article “Berlin’s Art Exhibition” (New York Times – 17th of May 1896) mentioned Menzel’s Portrait, the Sketches of the Versailles Park, the Venetian views and figures, whereas Jaro Springer mentioned only Menzel’s Portrait in his review “Die Jubiläums-Kunstausstellung” in Berlin 1896, in “Die Kunst für Alle” (XI, 19, 1896). The request for payment to the Künstler Genossenschaft related to the above-mentioned Portrait, proves that the painting was purchased to then be exhibited in the National Gallery in Berlin. was maybe in Venice with Maurice Barrès in September. He was then invited by the Princess of Caraman- Chimay at Chimay in October. It was the Count de Montesquiou who acted as an intermediary, thus proving that an early friendship existed between them. Giovanni took part in the “First Annual Exhibition” at Carnegie Art Gallery in Pittsburgh, opened on 5th of November, exhibiting Mme Veil-Picard’s Portrait and “Pezzo a quattro mani” (A four-hand piece). Apparently he participated in the Exhibition, organized in the same Gallery the previous year, as results from the catalogue which indicated three works: Girl, In the garden, Street Scene in Paris. Stanley McCormick from Chicago invited the artist in early 1897 to join him there; as he was enthusiastic about his mother’s portrait painted by Boldini, he wanted to introduce him to his wealthy friends, who might become the painter’s clients in America. He painted the magnificent Whistler’s Portrait in April, which was completed in very few posing sessions. During one of them, Boldini painted Whistler on a zinc plate employing a dry-point while he was dozing. But Whistler did not like this engraving nor did he like the one by Helleu, which he considered a copy of the pose in Boldini’s work. While Boldini was participating at a charity event on 13th of April, a fire broke out inside the Bazar de la Charité, causing several casualties. He exhibited both Madame Veil-Picard’s Portrait and Count Robert de Montesquiou’s Portrait at the Salon in Paris in April. Although the Veil-Picard’s painting dates back to 1897, the fact that it was presented at the annual Art Exhibition in Pittsburgh in early November 1896 indicates that it was completed slightly earlier. With regard to Madame Veil-Picard’s portrait, a communication from Olga to Boldini would hint at the time of its planning: Madame Veil-Picard confirmed the time of a posing session on a visiting card; she expressed her wish in a letter to receive a photo of the painting in order to be able to admire it instead of the original which was still in Boldini’s studio in Paris. The painter, in fact, due to his many commitments, postponed the delivery of the work to the Lady’s residence at Houlgate. Boldini began to arrange posing sessions for another portrait: Pauline Hugo with her son Jean. He completed it in 1899. Pauline was the famous writer’s grandchild – Georges Hugo’s first wife. which was also included in the catalogue. On the contrary, “Pezzo a quattro mani” (A four-hand piece) and “Piccolo ritratto d’uomo” (A small male portrait) were not accepted at the Exhibition probably because they had already been presented in previous exhibitions. Boldini continued to frequent Henry Poidatz. The editorial staff of the German magazine “Die Kunst für Alle” asked him for permission to reproduce some of his works: Madame Veil-Picard’s Portrait and Adolph Menzel’s Portrait. He had agreed to lend one of his works to the “Internationale Kunstudstilling” in Copenaghen but then he did not send anything and received a reminder in September to send Verdi’s Portrait, which had already been presented in Dresden at the Annual Exhibition of the Düsseldorf Club St. Lukas. The Art gallery manager, Johann Peter Schneider, also asked for permission to exhibit his watercolours which he had admired in Dresden. Boldini went on holiday to Aix-les-Bains in August. Felix Friedlaender from Vienna, asked him for his wife’s Portrait since everybody was looking forward to seeing it. Following the pressures of Antonio Fradeletto, Boldini travelled to Venice in September in order to fulfil his commitments as a member of the Jury at the Biennale. Mario de Maria had already encouraged him in June to accept this appointment; the antique dealer and designer Michelangelo Guggenheim also kept him up to date about what was going on in Venice. Boldini stayed in London from the end of September to the end of October (where he had probably also been in April). He was perhaps given a copy of Ten O’Clock with Whistler’s dedication on this occasion. At the beginning of November, he was invited to take part in the Union Artistique du Nord’s Exhibition to be held in the following spring. From then onwards, he maintained friendly relations with Marcel Proust who had admired his friend Robert de Montesquiou’s Portrait in his studio. witnessed at that time, Boldini exhibited works in New York that he had taken with him from Paris: Verdi’s Portrait, il Pastello bianco (The white pastel), Whistle’s Portrait, Princess Poniatowski’s Portrait, Mrs. Adolf Ladenburg’s Portrait and others which he had painted in America: Mrs. Stanford White’s Portrait and the Portrait of Elsie de Wolfe, the actress, who thanked him for the successful painting. He corresponded with Helleu and Sargent, expressing some concern regarding the modest assignments he had received and underwent an unpleasant customs inspection concerning a possible sale of some of his paintings. Sargent, however, convinced him to go to Boston and Chicago before leaving America, in the hope of procuring further assignments. Boldini informed Helleu of his immediate, personal success but also stated that he needed more time in order to achieve business success. Serious pneumonia confined Boldini to bed during the winter of 1898. He left New York on 16th of April and returned to Paris as soon as he had recovered. The organizers of the “International Art Exhibition” in London inquired as early as April about Boldini’s return together with his works, in particular Whistler’s Portrait, as they wished to present them at the Exhibition planned for May of that year. It was the first Exhibition organized by the “Society of Sculptors, Painters and Gravers”, founded on Whistler’s personal initiative. He had also been its President since February and Boldini was an honorary partner. The painter received an official invitation to participate in the Exhibition on 10th of May, where he only presented Edward G. Kennedy’s pencil portrait. Whistler’s insistence on having his portrait illustrated how much the American painter appreciated Boldini’s work. In Paris, he learnt that Leopolda Redi, Banti’s wife, had died in January. In May, he performed a grease pencil drawing, portraying Giacomo Puccini. He painted in the Dragon barracks in Versailles between summer and autumn of that year. He was allowed to work there thanks to Count du Liscoet’s interest, who was lieutenant of the regiment. He spent August in Saint-Moritz together with Duchess Grazioli, the Infant of Spain Eulalia and Marquis Antonio of Rudinì. He went to Trieste in October and took part in the “Mostra di Belle Arti di Ferrara” (Fine Arts Exhibition in Ferrara) from 13th to 27th of November, in order to celebrate the fourth centenary of Girolamo Savonarola’s death. He painted Eulalia of Borbone’s Portrait between October and December, working on it constantly. Boldini wanted the Princess to wear a white lace dress by Mademoiselle Nicaud, which he chose himself, rather than the initial black dress by Jacques Doucet. During the year, he participated as an honorary foreign member at the Exhibition promoted by “Vereinigung bildender Künstler Österreichs”, as results from the catalogue (p. 10: Boldini Jean, Maler, Paris, 41 Boulevard Berthier), together with Sargent and Whistler among others. He thus confirmed his desire to give his activity as a painter an international importance, which was sustained by his participation in the most important exhibitions in Europe and worldwide throughout the 1890s. Boldini requested Robert de Montesquiou’s intervention in February 1899, as he was a close friend of Pauline Hugo’s, in order to solve the issue of the payment for her portrait, whose agreed price of twenty thousand francs had been later contested by her. His friend tried in vain to settle the misunderstanding. This was maybe the reason why that painting remained in the artist’s studio who sold it to Maurice de Rothschild later in the 1920s. He went to Siena in June and spent his summer holidays in Engadine. He stayed in Venice for a while and exhibited his works at the “First International Art Exhibition” in St. Petersburg, where the Tsar admired them. His brother Giuseppe died in Australia at the age of sixty. At the “Universal Exhibition” in Paris in 1900, he presented: Portrait de dame, Princess Eulalia, Portrait de M. Whistler, Portrait de M. le Comte de M., Fleurs, Portrait de Mme Veil-Picard, Portrait de M. S. (Portrait de Mme Schneider), Danse espagnole and Parc de Versailles (watercolours). Boldini was awarded the Grand Prix and was appointed a member of the jury to evaluate the foreign works to be exhibited at the “Exposition Contemporaine des Beaux-Arts”. He went on a cruise on James Gordon Bennett’s yacht, an American businessman who was the owner of the “New York Herald”. He then spent part of the summer in Saint-Moritz. He painted Béatrice de Camondo’s pastel portrait, Moise de Camondo’s daughter, which was presented at the Exhibition “L’Enfant à travers les äges” at Petit Palais-Champs Élyseés in the following spring. In the same year (1900) he finished “Madame Speranza’s Portrait”, who loved the artist’s work. He took part in an international Exhibition in Brussels, where he exhibited Robert de Montesquiou’s Portrait among others. This painting was later placed in Montesquiou’s house in the Padiglione delle Muse at Neuilly. A flattering article praising Boldini was published in January 1901, in the first issue of the Magazine “Les Modes” signed by Robert de Montesquiou and illustrated with Boldini’s Portraits of some Ladies. He painted Lady Franca Florio’s Portrait in the first months of the year, but it was rejected by her husband Ignazio as it was considered to be too seductive. The painter modified it and when it was completed, he dated it 1924. Back in Paris, annoyed because he had not been appointed “Commendatore della Corona d’Italia”, he declared he would not exhibit his works in his country any more. He therefore refused to present Lady Franca Florio’s Portrait as well as Whistler’s Portrait at the IV° Biennale in Venice. He was in Italy again in August and had the opportunity of visiting Florence. He participated in the Exhibition organized by the “International Society of Sculptors, Painters and Gravers” in London with Princess Poniatowski’s Portrait. He painted the Portraits of both the writer Henry Gauthier-Villars and of the Paris Opéra dancer Cléo de Mérode. He spent 1902 in Paris, working intensely and dedicating many of his works to Madame de Joss. Ugo Ojetti became one of Boldini’s numerous acquaintances. Boldini might have been at 39 Hyde Park Gate, in London, between April and May. He resumed exhibiting his works in 1903. He presented a Portrait at the Paris Salon of the Société Nationale des Beaux-Arts. Against his wishes, his Lady Franca Florio’s Portrait was exhibited at the Biennale in Venice as it had been sent by the Florios. He participated in the New Gallery Exhibition in London in April with Whistler’s Portrait, which received flattering reviews by local magazines and newspapers, and also Nanne Schrader’s Portrait. Whistler’s Portrait was moreover presented in an itinerant exhibition in Philadelfia in October and later in Pittsburgh. Boldini refused to sell this work. While staying in London, he asked to marry his friend Cristiano Banti’s daughter; but Banti was not in favour. Once back in Italy, the marriage did not take place although he remained affectionately attached to Alaide. This fact caused the rupture of his long friendship with Banti. He spent the summer on the French coast at Dinard and Deauville. His activity as a portraitist continued intensely throughout 1904. Among the numerous works: Madame Victor Hugo’s Portrait (Dora, Georges-Victor Hugo’s second wife,) Edmond Rostand’s Portrait, Princess Maria of Hohenlohe’s Portrait and those of other Ladies. He exhibited two Portraits at the Salon du Champ-de-Mars: Portrait de la Princesse H. and Portrait de Mme de L. He was a guest of the Marquise of Montegnart at Uriage-les-Bains. Cristiano Banti died on 4th of December. Fradeletto invited him to exhibit at the Biennale in Venice in 1905. He presented a painting out of competition: Whistler’s Portrait which had been sent back from America. It was photographed by Vittorio Pica in order to be included in the volume dedicated to the Exhibition. Boldini painted Rita de Acosta Lydig’s Portrait, probably presented at the Salon du Champ-de-Mars with the title of Portrait de Mme L. Boldini also presented Portrait de Mme V.H. (maybe Madame Georges Hugo’s Portrait), and Portrait de M.W. (i.e. the Portrait of the writer Willy, Henry Gauthier-Villars). He also portrayed Cecilie Dubufe, Guillaume’s wife, improving the painting at a later stage. He received a letter from Isabella Falconer’s grandchildren, his previous benefactor. They asked for his help as they were living in poverty. He spent the summer at Vittel with Mrs. Joss, whom he portrayed several times. The news that Jeanne Max had sold the Portrait which Boldini had painted of her in 1896 to the Musée du Luxembourg, flattered the painter. He moved to Avignon at the beginning of 1906. Back in Paris, he was involved in the sale of the actor Constant Coquelin’s art collection on which occasion one of his paintings was also sold. San Francisco was partly destroyed by an earthquake in April and seven out of ten Boldini’s portraits in that city were destroyed. Portrait), Comtesse L. (Paulette Howard-Johnston’s Portrait) and Mme D. (Madame Dubufe). Boldini had in fact asked Guillaume Dubufe for permission to exhibit his wife’s Portrait. He completed Consuelo Marlborough’s Portrait, who was very grateful for the beautiful painting although it had been criticized for a rather affected pose. The painting was probably begun during the autumn-winter period of 1905 and Boldini would have liked to exhibit it in Paris in 1906. He continued a lengthy correspondence with the painter and illustrator, Madeleine Lemaire, whose participation in the first Biennale in Venice in 1895 had been supported by him. This painter used to organize festive meetings in her house among artists, intellectuals and writers, all belonging to the international middleclass. Robert de Montesquiou asked Boldini to put him in contact with the sculptor, Paul Troubetzkoy, to whom he wanted to commission a portrait in order to enrich his personal collection. Boldini did not exhibit any painting at the annual Salon of the Société Nationale des Beaux-Arts in 1907, but he continued working actively. He sent H.R.H. Princess Eulalia of Spain’s Portrait to the Exhibition at the Palace du Domaine de Bagatelle through Dubufe. He frequented Robert de Montesquiou’s salons. His brother Luigi died. During that year, he met Countess Francesca Notarbartolo di Villarosa, Count d’Orsay’s wife. The correspondence between them began in fact in 1907. He painted Mademoiselle Lanthélme’s Portrait, i.e. the actress and singer Mathilde Fossey, also known as Ginette. Because of this young woman’s sad story, who fell off the yacht on 25th of July 1911, belonging to her husband, the wealthy English tycoon Alfred Charles Edwards, this painting was not sold and became the property of the Italian State in 1914. At the beginning of 1908, Boldini completed two portraits, which he then presented at the Salon du Champ- de-Mars, entitled Comtesse de S. (maybe Portrait of a blonde Lady seated facing the observer) and Mme N. (i.e. Madame Nemidoff’s Portrait). He was about to finish a third one, which was not exhibited. In a letter to Francesca d’Orsay, he recalled his sudden visit to the Salon to see his two exhibited portraits and the warm welcome he received from the visitors. He presented Whistler’s Portrait at the Exhibition in Palace du Domaine de Bagatelle in May. This work belonged to Paul-César Helleu, who had bought it the previous January. Boldini went to Cauterets in the Pyrenees in July. Then he went to Toulouse and Bordeaux, he travelled to Italy in autumn and later returned to Paris. He continued to correspond with Francesca d’Orsay. Boldini suffered from pyorrhoea. Giovanni Fattori died in the same year. The artist suffered from a severe gum inflammation. He met Marquise Casati for the first time in September, probably in Venice; he even wrote to Francesca d’Orsay on 10th of November 1908, informing her of this Lady’s imminent arrival in Paris. Marquis Casati contacted the painter in the autumn of that year in order to commission his wife’s portrait, which was completed in a few months. Princess Marthe Lucile Bibesco of Bucarest, made arrangements with the artist in order to be portrayed by him on the basis of a drawing that Boldini had completed towards the end of the year, when the Princess was in Paris and posed for him. She inquired about the cost and put off the posing sessions for the final portrait until the following spring. The painter’s brother, Pietro, died in March 1909 in Bologna. “La Voce” published a monographic article on Boldini, signed by Ardengo Soffici, on 8th of March. The Salon was inaugurated on 13th of April and Boldini participated with three works: Portrait de la Comtesse P. (Countess of Pourtalès’ Portrait), Portrait de la Marquise C. and Portrait de M. et Mme L. (i.e. The Lydig spouses or Passeggiata al Bois). He asked Dubufe to exhibit his works in separate rooms in order not to irritate Marquise Casati, who had wished that her Portrait not be exhibited with others. The artist invited the Marquise to the Salon’s Opening: unfortunately, he fell ill and could not attend. He authorized the French and the foreign press to publish the paintings he exhibited at the Salon and the Marquise’s Portrait in particular, in spite of his usually negative judgement of reproductions, which he thought made the paintings horrible. Following his immense success, a remarkable review by Arsène Alexandre was published in “Le Figaro” on 14th of April, which defined Marquise Casati’s Portrait as the “most beautiful example of pure painting in the entire Salon”. Boldini sent this Portrait to Rome so that it could be exhibited in the Palace in via Piemonte 25. Due to a health problem, Boldini went to the thermal town of Pougues-les-Eaux in the summer, where he met Eugénie Legrip, a young and beautiful girl known as “the Divine”. A couple of days after his return to Paris in September, he travelled to Venice where he spent a month before going to Milan where he was Marquise Casati’s guest. He also stayed in Turin and Moncalieri that year, probably because he had become acquainted with Princess Letizia Savoia d’Aosta. At the Salon in 1910, he presented three portraits: Mlle Errázuriz, La Duchesse de Montellano and Mme Doyen. Princess Bibesco was in Paris in May and she visited the artist as she had promised. He painted the first of two known half-length portraits. This work was completed in July and sent to Bucarest. Several years later in an unpublished text, the Princess narrated her encounter with Boldini in Paris, during a dinner at Marquese de Ludre’s mansion in 1907. On that occasion, the painter expressed his wish to portray her. She visited the artist for a whole month and he made a pencil drawing at first. Boldini received the final payment for Cécile Murat’s Portrait in May, which had been admired in an Exhibition in Brussels. After the Salon, he went to Versailles and later travelled to Italy. Back in Paris, he wrote to Gabriele d’Annunzio, with whom he shared the love for worldly life although they had never really been friends. enthusiastic about it, but when it was exhibited at the Salon du Champ-de-Mars that same year, it was rejected, however, by her husband because he considered it to be scandalous. Boldini refused to carry out any modifications and received an injunction, forbidding him either to exhibit the work or to sell it. The painting remained in the artist’s collection until after his death. 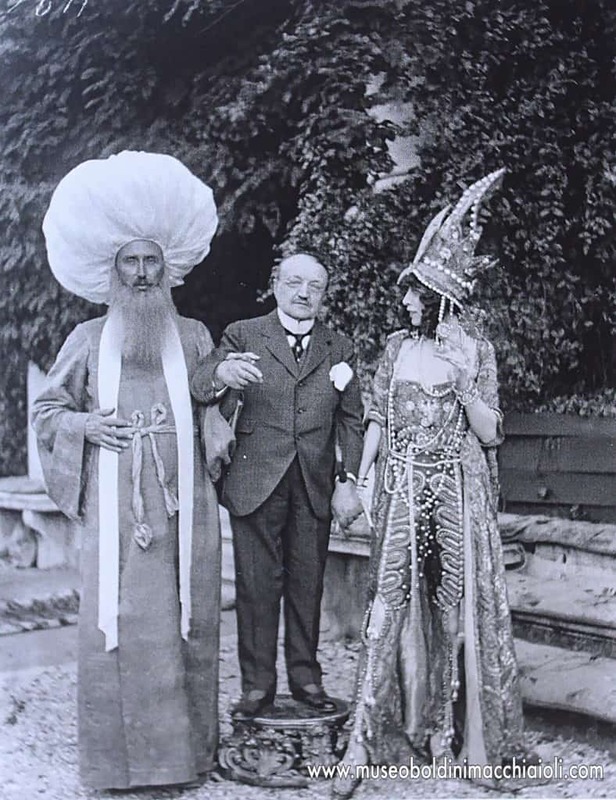 Boldini with Marquise Casati and her husband. Five of his paintings were actually exhibited at the Paris Salon: together with Princess Bibesco’s Portrait, the artist proposed those of Mme P.S.P., Mme G.V., Mlle M. de H. and a Still Life. He wrote to Gabriele d’Annunzio, suggesting his portraying of Mademoiselle Rubinstein in the warrior costume, worn in Le Martyre de Saint Sébastien, a work d’Annunzio had written for her. Boldini met Lina Bilitis that year and she posed for him as a new model until 1919. He continued corresponding with Francesca d’Orsay, to whom he revealed his difficulty in portraying Marquise de Rudinì and his imminent meetings with Count Zubov. He participated at the Salon in 1912 for the 14th time and exhibited: Portrait de M.H., Portrait de Mme H., Portrait de Mme B., Portrait de la Princesse B.,i.e. the half-length portrait of the Bulgarian Princess. He asked Marquise Casati not to exhibit her Portrait at the Biennale in Venice, where he personally participated instead with Marquis Antonio de Rudinì’s Portrait.His sister, Veronica, died in Bologna at the age of sixty-two. Boldini continued his correspondence with Carlo Placci. The artist took part in the “International Exhibition in Amsterdam” (from 13th of April to 15th of July 1912). Contrary to the Bibescos’ requests, he also presented the full-length Portrait of the Princess and the Portrait de M. S., probably the Portrait of young Subercaseaux. He worked with the models, Lina and Peggy, in Paris at the beginning of 1913 and continued to correspond with Marquise Casati, reminding her that he still needed her dogs. Perhaps his initial idea was to also include them in the Portrait of the Lady with the peacock feathers. This painting was subjected to several modifications and remained incomplete in the painter’s studio; only after various property transfers was it donated to the National Gallery of Modern Art in Rome in 1960. The artist wrote to Ugo Ojetti on 2nd of January 1913 to inform him that he had promised Marquise Casati, who was in Paris at that time, to paint another Portrait of her in exchange for the one with a greyhound painted in 1908.The idea was to sell it to the National Gallery of Modern Art in Rome for the same amount she had paid for it, i.e. thirty thousand francs. In the permanent Commission for the Gallery’s acquisitions’ report, at the Assembly on 31st of March 1913, there appeared the proposal to buy some works among which, an oil painting by Boldini (n.6), which was marked with a question mark (“?”). The handwriting was apparently attributable to Ojetti. The acquisition did not take place because the price for the painting was considered too high. In an article entitled “Notes about Art” published in “Giornale d’Italia” on Monday 20th of July 1914, referring to the purchases in Venice, it was mentioned that one of Anglade’s paintings had not been purchased due to its high price and that the same had happened to one of Boldini’s works: “Because the Anglade case is not an isolated one. Right now, we have had a Boldini case, which caused a lot of clamour and only happened as one of the members of the notorious Council so wanted it. Moreover, there are blind purchases and other similar pranks that are being repeated with questionable frequency and regularity. […] The problem is to understand whether the Council acts according to its constitution, rather than as a very useful Organism favouring the small personal ambitions of some members, which are, however, detrimental to the State’s interests”. Ojetti, quite annoyed, replied to the journalist by reiterating the transparency of all his actions in public office. 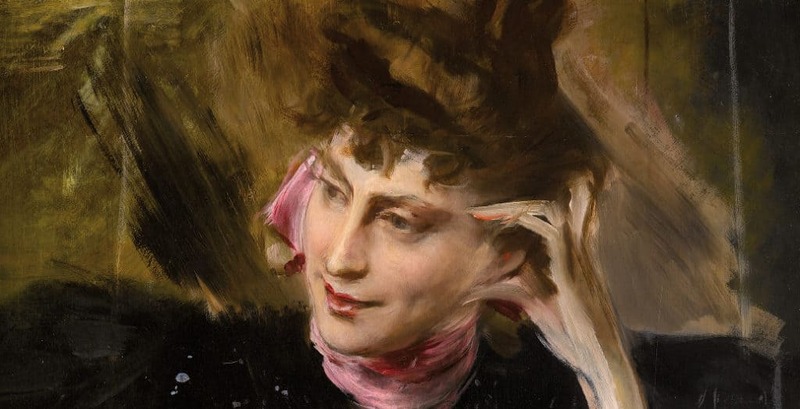 Boldini’s travels during this period were very frequent: he went to Rome in the spring, to Bologna in the autumn and finally to Florence whereas his planned trip to Venice in September, as Marquise Casati’s guest, probably did not take place. These were indeed a Male Portrait and a Female Portrait; the latter was perhaps Peggy’s Portrait. Boldini wrote about it to Francesca d’Orsay: “Peggy’s Painting at the Salon is having a fantastic success”. He discussed with Alaide Banti the issue of some of his past paintings concerning Battistini’s sale, which Boldini did not consider to be autographs. Actually, these works belonged to the Bantis, and Alaide was sure that he was their author. His brother, Gaetano, wrote to him expressing his financial problems and Boldini reassured him by promising his support in case of need. He received the payment for his Madame Edwards Gandarillas’ Portrait. He exhibited Portrait de Mlle R. and Portrait de Mlle L. at the Salon in Paris. G.G. Sarti, correspondent for “La Tribuna”, described the paintings in “Esposizioni Parigine”. Boldini did not participate in the Exhibition at the Salon after this year until 1921. Meanwhile, the first World War broke out and the artist travelled frequently: from Nice to Glasgow, Southampton, sometimes London, Paris and then Spain at the end of the year. He received several letters from Amédée Kahn, who reassured him about his financial matters and bank accounts. He wrote to his brother, Gaetano, expressing his sorrow concerning the bad state of his business, certainly due to the ongoing military conflicts. Teresa Marescotti Venosa wrote to him from Rome thanking him for the magnificent portrait of her deceased husband, Marquis Ignazio Boncompagni Ludovisi, Prince of Venosa, which was greatly admired in their home in Rome. Cécile Murat requested the artist to create her portrait, which he began in 1910. His brother Gaetano’s wife died in May 1915 and he moved from Bologna back to Ferrara. The price of a portrait by Boldini was between thirty and fifty thousand francs in that period. His eye-sight problems worsened; we know little about the 1917-18 period, in which he spent most of his time between the Côte d’Azur and Paris. He resided in Nice as from February 1918 onwards and he had some of his paintings sent there in order to save them from the bombing. He left Nice on 5th of December and returned to Paris. It was actually in this period that Verdi’s Portrait was donated to the Modern Art Gallery in Rome. Boldini was conferred with two important titles in 1919: Officer of the Légion d’Honneur on 14th of January and Officer of the Italian Crown on 29th of July. He began to grant life annuities to his niece Eva and to his brother Gaetano, with whom he was constantly in correspondence. Boldini asked Gaetano to send him some photos of flying pigeons, preferably in Venice, as he needed them for a painting. Boldini was already 77 years old, with a progressively worsening health and found himself increasingly alone. He had intense correspondence with Maria Vendeghini Baldi, the daughter of Ferrara Enea’s old friend; the artist expressed, in these letters, how much he missed his home town but he felt that he could not face a long journey owing to his poor health conditions. with Maria Vendeghini Baldi, who lost a child in May. Boldini expressed his sorrow for that terrible bereavement and encouraged her to assist her other son in continuing his artistic studies. The artist suffered from arthritis in his left ear. Thinking back to a pencil portrait of his parents, which he had painted in his youth, he declared that even after so many years he could not have done it any better. He took part in the “First Art Exhibition in Ferrara” which began on 29th of April. In spite of the painter’s solicitations, Marquise Casati did not send her Portrait with greyhound to Ferrara. Boldini reaffirmed to his brother, Gaetano, the stagnating condition of the art market and that he did not wish to participate in the annual Salon. He expressed his admiration for Gabriele d’Annunzio and planned to go to Ferrara at the end of September in order to congratulate the brave Fascists of that town. He corresponded with Filippo Tommaso Marinetti showing his interest in the most innovative artistic events. He resumed exhibiting at the Salon du Champ-de-Mars this year. He presented two paintings: Madame Harjès’ Portrait with two children and Mme Letellier’s Portrait. The New Zealand painter Grace Jane Joel congratulated him for the originality of the first painting. Many of his works were sold at several auctions in Paris. After losing many teeth, Boldini had to resort to false teeth. 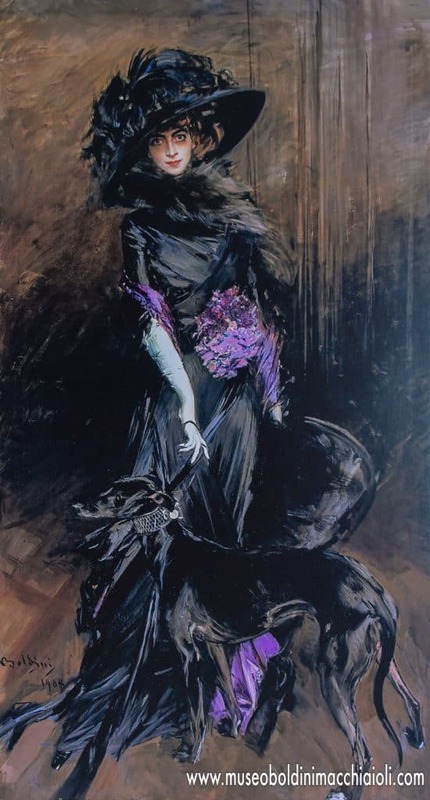 Robert de Montesquiou dedicated a poem to three of Boldini’s famous paintings: his own Portrait of 1897, Marquise Casati’s Portrait with greyhound and Madame Harjès’ Portrait with two children. Mrs. Edwards’ Portrait with her four children was the subject of a lengthy, legal dispute in 1922 because the contract foresaw the representation of only one child and not all of them. The painter lost the case and was compelled to consign it to the commissioners. This work ended up in Chile in 1928. As early as 29th of July 1922, the artist replied to Mr Edwards, who had contested the price of the painting. Maria Vendeghini Baldi died on 18th of June after a long illness. Boldini revealed to her husband, Giovanni Baldi, that he was often thinking of death and that he wished to prepare an exhibiting location in Ferrara, which would be suitable to house all the works he would donate to the town after his death. He wrote to his brother, Gaetano, asking him to find a house in Ferrara where he would have loved to live again. He also reported to Gaetano and Baldi about the problem he had to face with the Edwards family. But he later changed his mind and thought of moving to Rome. He exhibited two works at the Salon: Mme Edwards et ses enfants and Mme Edwards. He suffered from sciatica. He wrote to Alaide Banti that he was planning a trip to Castiglioncello and claimed that she had refused him because of her secret love for Frederick Stibbert. He complained to have grown old, to have bad eye-sight and to be deaf in one ear. He continued his correspondence with Marquise Casati. He went on a trip to Rouen in March 1923 and to Ostend and Lamalou in the summer where he met Countess Grazioli. His brother, Gaetano, whom Boldini had already been supporting with a maintenance allowance for some years, reached him in Paris. His housekeeper, Berthe, who had been working for him since 1895, got married and quit her job. Boldini congratulated Marquise Casati for her purchase of Palais Rose du Vésinet in Paris, which had belonged to Robert de Montesquiou. He received some photos of Alaide Banti, which he greatly appreciated. She provided him with a new Swiss housekeeper, named Marie Rouiller. Boldini exhibited two other works at the Salon the following year: Portrait de la Marquise P. del Rio and Portrait du Comte Sforza. Boldini went to Brittany at the end of August 1924, but he was forced to leave quite soon because of the bad weather conditions. He had frequent correspondence with his brother, Gaetano, concerning his likely move to Ferrara and the chance of setting up a museum dedicated to himself. He was, at first, attracted by the possibility of living in Palazzo dei Diamanti (Diamonds Palace) but as this accommodation was not available he rejected any other solution. He declared that France would also have needed somebody like Mussolini in order to deal with the problems of the nation. His eye-sight worsened. He complained to Alaide about his housekeeper’s extremely severe character; he wished to dismiss her, which he finally did. Carlo Placci congratulated him on the memorial plaque which the Ferrara municipality had affixed at his birth place. The artist complained, though, because only his activity as a portraitist was mentioned and not his previous work when he had produced “all kinds of paintings”. “La Stirpe” published an article in November, which described all the stages in the painter’s career. liked to go to Italy, but his model, Suzy Lecormie, fell ill with tuberculosis. He employed a new housekeeper whom he defined “short and evil-smelling”. He reached Suzy at Cannes where he stayed at least until February of the following year. Boldini was together with Suzy at Cabourg in August 1926. He travelled to Paris in September where he gave a well-known interview to De Pisis. Gertrude Corbitt was received by the painter in his studio for the posing sessions of her portrait. Boldini’s decisive meeting with Emilia Cadorna dates back to this period; she was a journalist of the “Gazzetta del Popolo” of Turin, who interviewed him at his studio. An affectionate friendship began then which resulted in marriage three years later. The marriage between the 27-year-old Emilia, who was previously civil-married to Massimo Mencarelli in 1923, and the old artist caused great perplexity to his brother, Gaetano, and also to his closest friends. Many years later, according to a testimony, recorded by Raffaele Monti, Boldini widow declared that their marriage had never actually been consumed, but had been an experience with tormenting affection and rich in a subtle, however, never fully-expressed eroticism. Only now, are we aware of Emilia’s extra-marital affair with the sculptor Francesco “Francis” La Monaca, in which she had already been involved a year before her marriage. She married him a year following Boldini’s death. His brother, Gaetano, worried by a press article published in Italy concerning the famous artist’s serious health conditions, sent Luigi and Carlo Lega to Paris, who discovered the exaggerations written in that newspaper. Boldini’s health conditions worsened, though, in the following couple of years: he suffered from rheumatism, he underwent prostate surgery and his eye-sight progressively weakened. He received a passionate letter from Lola Laskaraki in 1927, in which she recalled their love affair. Boldini considered again the idea of returning to Ferrara. A small anthological exhibition was dedicated to him during the “Settimana Ferrarese” in 1928, but he was quite irritated by the fact that some of the paintings produced during his youth had been included in the selected works. At the inauguration of Torre Vittoria, the following paintings were exhibited: Countess Lydia Magnoni Monti’s Portrait, Self-portrait as a young man, Carolina Magrini’s Portrait, Giuseppe Verdi’s Portrait, Princess of Hohenlohe’s Portrait, Portrait of a Spanish General, Count Maraini’s Portrait, A farmhouse yard, The Sentry, A painting made at the age of twelve, His Father’s Portrait. The artist was appointed “Commendatore” of the Order of the Saints Maurizio and Lazzaro. The “Podestà” of Ferrara, Renzo Ravenna, considered the possibility of conceding to Boldini a prestigious dwelling in his town of birth but Boldini’s living with such a young lady was still a cause of prejudice and thus prevented it. Boldini complained to Maria Lega about the works exhibited in Ferrara and above all about the imprudence in transporting Verdi’s Portrait from Rome. Emilia Cardona began writing the artist’s biography, together with Giovanni and his brother Gaetano, which became the most complete biography in spite of some inaccuracies. The marriage to the young journalist, who had just been legally separated from her first husband, was celebrated in 1929, in the presence of a few close friends: she was thirty and he was eighty-seven. Boldini asked Gaetano to provide Emilia with more information about his past life. Alaide Banti died. The artist called her “my fiancée for sixty years”. Boldini’s health worsened in 1930 in spite of his wife’s loving care. He informed Gaetano, in one of his last letters, that he had been very ill. In fact, Emilia wrote to Gaetano to explain the immense difficulty the artist had had in writing the letter. Boldini died on 11th of January 1931 from a worsening of bronchopneumonia. He was buried in the Certosa Cemetery in Ferrara, next to his family members. Some months later, his widow published Vie de Jean Boldini in Paris, which she had been writing under the guidance of Boldini himself. A retrospective exhibition of the great Italian painter was inaugurated on 7th of May at the Charpentier Gallery in Paris.